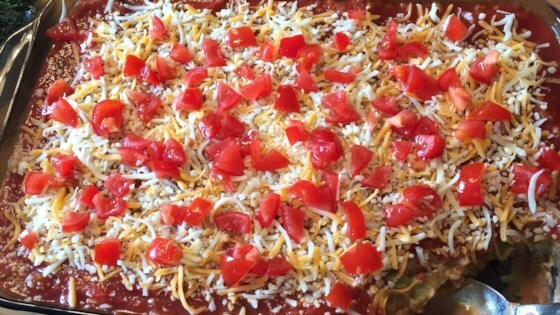 "The traditional 7 layer dip can be rather fattening, so here is a fresher, lighter alternative. It requires a tad more work, but I assure you it is worth it! I always have people asking for this recipe." Mix together the sour cream, garlic, jalapeno pepper, cilantro, taco seasoning, hot pepper sauce, and 1/2 of the lemon juice in a bowl until well blended. In another bowl, mash the avocado with the remaining lemon juice; set aside. Spread the shredded lettuce over a 12-inch serving platter. Layer the black beans evenly on top, followed by the Mexican-style corn. Spread the prepared sour cream mixture over the corn. Gently spread the avocado mixture on top of the sour cream. Pour the salsa evenly over the avocado mixture. Sprinkle the Mexican cheese blend, olives, green onions, and tomato on top. This recipe is so diverse. You could also add Mexican rice if you wanted, or use spinach for lettuce instead of shredded. Sometimes I make this as a salad by doubling the lettuce and halving all the other ingredients, and dollop them on top of the lettuce instead of spreading! This will stay for about 2 days in the fridge. Really very good. I loved the comparative lightness of this recipe. Made as described except for omitting the corn and using only half of the pepper. Thank you. Excellent! Brought it to 4 th of July bbq...didn't tell anyone it was "skinny". Everyone loved it! Thank you so much! The only change I made is I made my own salsa. This was delish! There are a lot of ingredients, but it's worth it. I did forget to add the corn, but I followed the recipe exactly otherwise. I will definitely make this again! Excellent recipe. Whipped up real quick for Cinco de Mayo party. It makes a lot! (40 servings), so I recommend either halving the recipe, or plan on having leftovers for the next week. Awesome recipe, everyone loved it and asked for the recipe. Will definitely make again for our next gathering. Thank you! Great dip! I think I will add more sour cream next time. It just needed a little more of that layer.